Oz and Hilton Head Island have their fair share of similarities. Wicked witches and flying monkeys aside, Hilton Head Island is a wonderland of unique experiences, kind individuals, and beautiful vistas. HHIWFF often acts as the twister, bringing unsuspecting visitors to the island, and by the end of the week, they rarely wish to leave. Most of the fanfare focuses around the two major events: the Grand Tasting and Public Tasting. This year, they occur March 10 and 11, respectively. With hundreds of vintages and dozens of varietals, there is little wonder why this intimate affair has grown into one of the “can’t-miss” wine festivals on the East Coast. Also, owing to Hilton Head Island and the award-winning Sea Pines Resort, it’s hard to argue that there is a more beautiful wine and food festival in the country. The magic of the event, however, is not rooted in the majesty of Hilton Head Island or the plethora of tasteable wines; it emanates from supporting local scholars. The John and Valerie Curry Educational Scholarship was created to generate scholarships for local University of South Carolina Beaufort and Technical College of the Lowcountry students. Promising hospitality and tourism scholars receive a stipend to support their education. In recent years, HHIWFF generated $42,000 in scholarship money for the cause. George Cummings, another recipient, expressed his gratitude for beig selected based on his educational merit and academic achievements. The scholarship will allow him to “complete the pursuit of [his] bachelor’s degree in hospitality management without the concern of personally funding the cost of this endeavor,” he said. 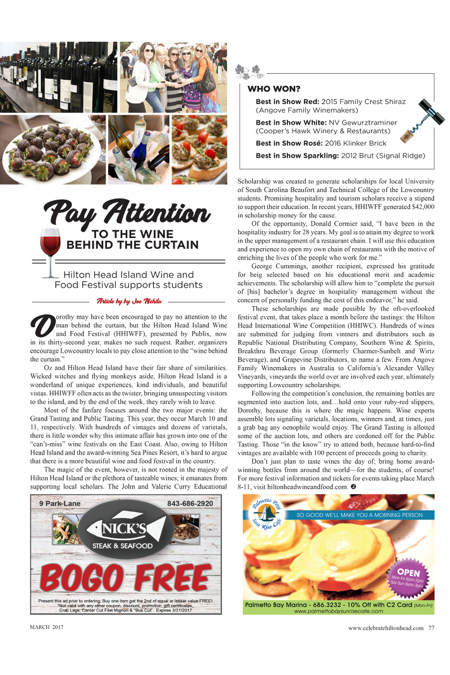 These scholarships are made possible by the oft-overlooked festival event, that takes place a month before the tastings: the Hilton Head International Wine Competition (HHIWC). Hundreds of wines are submitted for judging from vintners and distributors such as Republic National Distributing Company, Southern Wine & Spirits, Breakthru Beverage Group (formerly Charmer-Sunbelt and Wirtz Beverage), and Grapevine Distributors, to name a few. From Angove Family Winemakers in Australia to California’s Alexander Valley Vineyards, vineyards the world over are involved each year, ultimately supporting Lowcountry scholarships. Following the competition’s conclusion, the remaining bottles are segmented into auction lots, and…hold onto your ruby-red slippers, Dorothy, because this is where the magic happens. Wine experts assemble lots signaling varietals, locations, winners and, at times, just a grab bag any oenophile would enjoy. The Grand Tasting is allotted some of the auction lots, and others are cordoned off for the Public Tasting. Those “in the know” try to attend both, because hard-to-find vintages are available with 100 percent of proceeds going to charity. Don’t just plan to taste wines the day of; bring home award-winning bottles from around the world—for the students, of course! For more festival information and tickets for events taking place March 8-11, visit hiltonheadwineandfood.com.